Sometimes I look at other bloggers and wonder how in the world their lives can seem so perfect. The house, the adorable kids, the doting hubby, and what seems like unlimited resources to buy as many craft supplies as they want. Then I remember the key word in that first sentence: Seem. Of course we aren't going to air all of our dirty laundry for the whole world to read. Life as a wife and mother is hard, and if things SEEM perfect on our blog or Facebook then maybe reality will catch up. Unfortunately, there is a catch to this method: By making ourselves seem perfect to the outside world we are setting ourselves up to be very lonely. 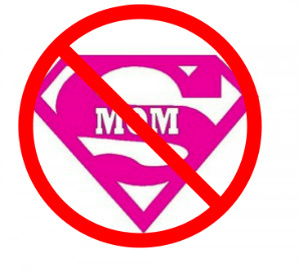 No one wants to hang out with Super Mom and feel inadequate. Meanwhile, Super Mom is lonely and exhausted from putting on this impossible front of perfection. I have had so many friends and family members call me Super Mom, and I try. I try so hard that I am constantly exhausted. The truth is I am NOT Super Mom. I am "Just-doing-my-best-and-sometimes-not-even-that Mom". I have 2 children with ADHD whom I adore, but absolutely drive me up the wall. My third child tantrums day and night and won't go to sleep without being held. It is exhausting. There are times when I should be crafting with my kids, or reading to them, but instead I let the TV babysit while I Facebook. I am constantly stressed out and suffer from anxiety and depression. I'm not always sad. In fact, I am very happy with my life the way it is, but that is partly because I take antidepressants. I also cope with stress by over-eating. I am the heaviest I have been in years because I eat to deal with stress. Some people drink. Others smoke. I eat. I'm honestly not sure which is worse. I craft and crochet because they are outlets for my frustration. When I turn something ordinary into something beautiful it gives me hope that I can do the same with my life. I blog because you all make me feel less alone. I'm telling you all my deepest, darkest secrets because I need it, and maybe so do you. In a world of Pinterest where everything SEEMS perfect I want you all to know that you are not alone in your imperfection. My life is imperfect and stressful, and I am the most imperfect factor in that equation, but I wouldn't trade my life for a Pinterest life. Oh Macy, you are not alone ! Most of what's going on in my life and blog is "seem" although I prefer the word "pretend" that all is okay. Now and then I will blow off some steam or share something from my real life, but for most of it - life is not what it seems, and that counts for a bunch of bloggers. I might not be an old hand at blogging, but I quickly discovered that bloggy friends are some of the best. Thanks for sharing your bit and also know that YOU are not alone. Macy I love that you are you! I love that you express yourself I haven't met you in person but I feel like I have known you a majority of my life. I am glad to get to know you through Jeremy. I hope we can meet one day for reals lol. You are never alone, you can always message or call me if you ever just need a listening ear! It's so easy to get caught in blog world and feel completely inadequate. I've been there. No one knows what happens behind closed doors of these "Pinterest perfect" bloggers. All we can do is focus on ourselves and our families. I have a son with ADHD so I can relate. Hugs. Thanks for being real. So true! Love your true honesty. The reality is that most of us are just like you I know I am. It is very refreshing to see the realness in you THANK YOU. Really tired of bloggers coming across as pictures of perfection. Your candor touched my heart. Thanks! You are definitely NOT alone! I had such a problem with all that "perfect world" junk last year that I pretty much psyched myself out of doing anything at all. I'm sure you know the feeling...("so & so already made that project", or "their ideas are always better than mine") It was totally exhausting, and I wasn't even doing anything! Thank you all for your wonderful comments! They mean so much to me! Great post. The longer I read blogs the more I find myself drawn to the ones that seem to be more human. I am not perfect. I have had my share of craft fails. While I do a lot of cleaning it is not always enough to keep it pristine. I find more inspiration in the bloggers who are like me and have both their successes and failures. Thank you for being so candid and honest. I think every mom who reads this relates and appreciates everything you said. It was real and it was the truth. Thanks for sharing Macy!